As moms, we go through a lot for our families. From the moment we become mothers our lives are irrevocably changed. For better or worse, nothing will be the same. 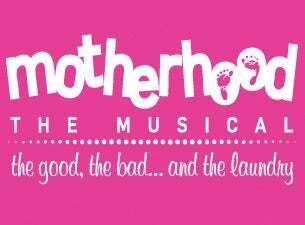 Motherhood the Musical covers all the ups, downs, and comical moments of motherhood. Last week I was fortunate to attend the opening night performance of Motherhood the Musical. I can honestly say that I haven't laughed that hard in a long time. This musical takes place during a friend's baby shower. Three seasoned moms with various backgrounds share their experiences (good, bad and outrageous) with the expectant mom. For a full 90 minutes, I ran the full spectrum of emotions. I laughed with songs like mammories (memories about having better cleavage) to Costco Queen (the satisfaction of finding everything you could ever need at the warehouse giant). Other songs, like Danny's Mom, made me wistful thinking about all the special times with my kids. 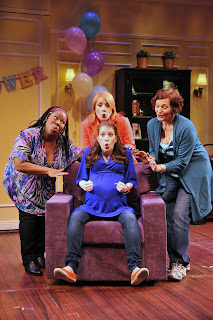 Motherhood the Musical is playing at the Royal George Theater in Chicago now through May 30. Tickets are $63.50 including fees. If your mom group is looking for a fun night out, if you are planning a baby shower or you would like to remind your husband of all your hard work as a mom, I would highly recommend seeing Motherhood the Musical. Disclosure: I received tickets to attend opening night of Motherhood the Musical. All opinions are 100% mine. For my personal disclosure policy, please visit www.more4momsbuck.com/disclosure.